Open blog to BP – I’m available! If you run a small or medium size business you work jolly hard, hope everyone pays you (they’re big, you’re little) and obsess about cash flow. By contrast should you be lucky enough to be selected as the CEO for a big corporation happy, happy days. Brilliant or hopeless you always end up the winner even if you spread a liberal helping of unhappiness along the way. Here is what I mean. BP has confirmed that Tony Hayward is leaving with a £1m payoff and a pension, expected to be about half a million pounds a year, as the oil giant reported one of the largest corporate losses in British history due to the cost of the oil spill in the Gulf of Mexico. Tony has halved the value of BP together with over-seeing the death of 11 platform workers and devastating the economy and ecology of several American states. If/when BP is found guilty of gross negligence should he a) collect £500,000 every time he passes go or b) go to prison and have his get out of jail free cards confiscated? My chum Paddy likes to use this blog to keep up with news on the poor lady in Iran. Her sentence has been commuted from stoning to hanging, OMG, and her lawyer is in hiding. This week, Iran issued an arrest warrant for Mohammad Mostafaei, the lawyer who volunteered to represent Mohammadi Ashtiani. Mostafaei has gone into hiding, but Iran has taken his relatives hostage to force him to reappear. To offset starting my blog on a downbeat note it’s time to lift the spirits with this bit of brilliance from Newport, West Wales. Don’t miss out, click on the link and be prepared to chuckle lots. Love the bit about Alicia Keys and Shirley Bassey and ‘One hand in the air for the taxi’, not sure why. If you have got the taste for a bit of Shirley here she is with Dizzee Rascal, amazing (it starts with Gary Barlow, scroll to around 4 minutes for Dizzee). At the risk of offending young Susan Probert (an ATOM teamster) who told me blogs with football are boring, I just have to direct you to this clip of an amazing penalty scored by a Spanish youngster in Under 6 World Cup. Unbelievable and proof that the Spanish are going to be a world force for many years to come. Compare and contrast with the second clip featuring a Brazilian trying what they used to be good at before they started playing like England. 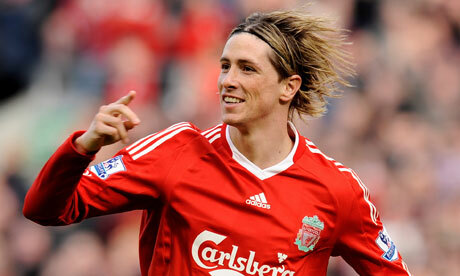 For picture of the week, here is Torres when he was good and then after he got a touch of the Samson’s. Sticking with sport for just one second, news came this week that boules is now officially über cool (click on this link to find out more http://www.guardian.co.uk/lifeandstyle/2010/jul/28/france-boules-petanques-got-cool). I can relate to that, it’s a brilliant game. What about getting the local authorities in Dubai to set up a few courts? If any of you have ever been down near the kite surfing beach there are a series of excellent volleyball and football courts/pitches which are free to use and apparently you can also borrow kayaks for free. It’s always easy to criticise and moan but hats off for the many great things the Dubai government has done to make this a pretty damn good city with a world-class infra-structure. Last week I went to see Toy Story 3, apart from a having a three-month old baby as my next door neighbour (fortunately after a five-minute chunter he fell asleep) it was brilliant. So clever and witty and beautifully observed. The following night saw a trip to my favourite restaurant, Asha’s, AED 200 each for great food and several drinks. I gobbled up Laal Maas (a no sharing policy was strictly observed), very spicy and to say it hit the spot doesn’t do it justice. I also made my second visit to Spinneys this summer. How do they sell cooked chickens for less than AED 10? Are they really curtailed chickens or fat rats? Finally tip of the week, you can download the brilliant new Arcade Fire album on Amazon UK for around £3.99 on Monday 2nd August (one day only). Despite England’s sharp exit I’m still fixated with the World Cup, sorry. Now we know for sure the big man upstairs doesn’t care about football. 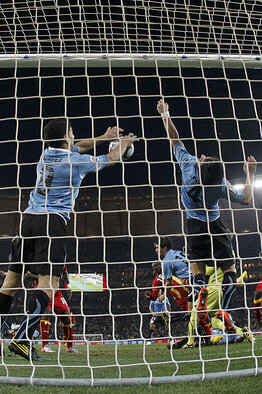 Suavez’s last-minute handball wasn’t punished and Uruguay are through to the semi-final. Rugby has a penalty try for deliberate cheating, football has now lost all credibility. 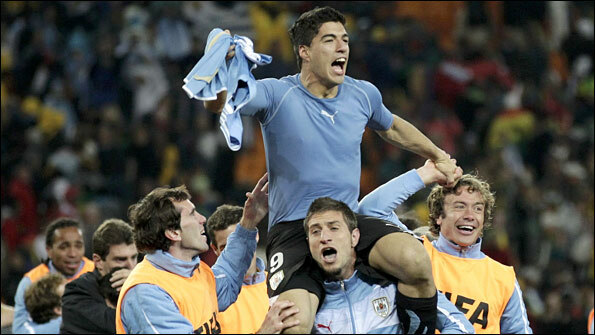 “The Hand of God now belongs to me. 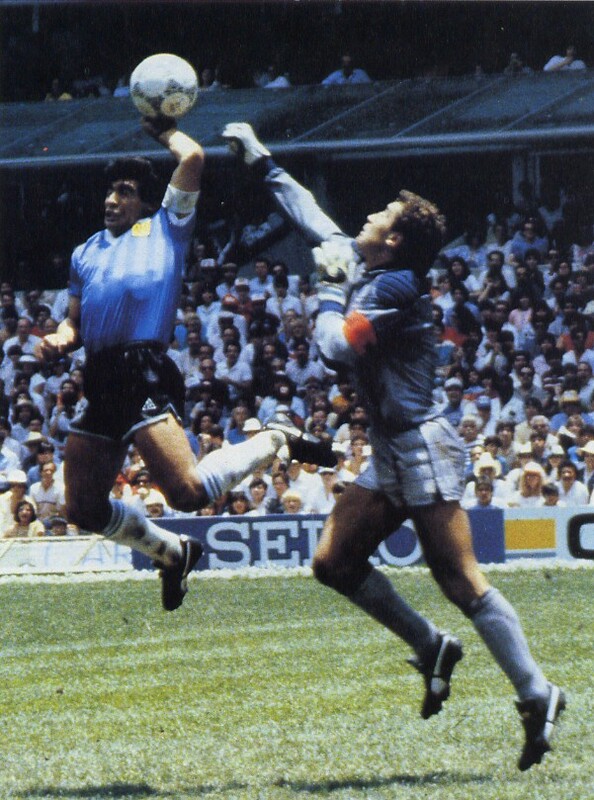 Mine is the real Hand Of God. I made the best save of the tournament. Sometimes in training I play as a goalkeeper so it was worth it. There was no alternative but for me to do that and when they missed the penalty I thought ‘It is a miracle and we are alive in the tournament’.” His punishment, a one match ban! FIFA had their chance, they should have banned Maradona when he openly admitted he cheated and then we wouldn’t have been left with World Cup where cheats are treated as heroes. I was very disappointed with Brazil. They spent the whole of the match against Holland trying to stop Robben by foul means and completely forgot about Wesley Sneijder – my player of the tournament so far. It was horrible to watch Brazil trying to kick their way to victory. Meanwhile Capello keeps his £6 million a year job and vows to bring in new players. Fabio, here is one for you – Adam Johnson. I spotted him last year and he should have played a starring role in the World Cup. Instead you picked his understudy at Man City, Sean Wright-Phillips and played Milner in the position he left behind two years ago. Final word on football (until next week) can someone please explain to me why Chelsea let Joe Cole go and have since signed Yosi Benayoun? One classy English player for an OK Israeli, a very strange decision which leads me to predict Chelsea won’t win anything next year and their sugar daddy is preparing to up sticks. Changing subject completely, I was left cold and seriously angry by the decision of a court in Iran to sentence a 43-year-old mother of two to death by stoning. The barbarity is beyond belief but other things struck me about this case. Firstly there was zero evidence; Sakineh Mohammadi Ashtiani was convicted in May 2006 of conducting an “illicit relationship outside marriage” on the basis of “judge’s knowledge” – a loophole that allows for subjective judicial rulings where no conclusive evidence is present. Secondly, under Iranian sharia law, the sentenced individual is buried up to the neck (or to the waist in the case of men), and those attending the public execution are called upon to throw stones. If the convicted person manages to free themselves from the hole, the death sentence is commuted. Treating women like tenth class citizens is one thing but oh my god. Please click on the link below for the full article. I sprang out of bed this morning and yet another thought popped into my head – if Britain’s green and pleasant land is warmed every year by the Gulf Stream are we going to get more than we bargained for this year? As always I turned to Wiki for a better understanding of what could happen. The Gulf Stream, together with its northern extension towards Europe, the North Atlantic Drift, is a powerful, warm, and swift Atlantic Ocean current that originates in the Gulf of Mexico, exits through the Strait of Florida, and follows the eastern coastlines of the United States and Newfoundland before crossing the Atlantic Ocean. I watched bits of the Glastonbury Festival, Muse were amazing (click on the link for a bit of shock and awe) and Stevie Wonder is a legend. However Stevie you should really consign I just called to say I love you to the dustbin of history. How could somebody so talented write such an awful song? Also it’s worth checking out Gang of Four – they are back! For those who don’t know them they are a Brit band from the 1980’s credited by the Red Hot Chilli Peppers as being the band that most influenced their music. With Dubai clearing out for the summer, news is a bit sparse. I’m going to dedicate the next few weeks to unearthing bargains. For all of you golfers out there click on the link for summer rates. Yas Links is highly recommended, it was designed by the same guy who created Kingsbarn, my favourite course in the whole wide world. Another bargain – check out MMI’s summer wine offer in-store while it lasts. Monster savings on some very drinkable wines. Click on the link for store locations and if you want to avoid tax give Barracuda a swerve and head off to Al Hamra Cellar. With my family off for the summer we had a bit of clear out. These are my top 5 from when Florence and Beatrice were tots (they all escaped the clear out!). Join in the banter and please leave your comments below.